If André Breton and Bruno Bettleheim were to reinvent English between them, they might write poems like these. Verging on the surreal, sometimes near-hallucinatory, Denise Ryan’s poems are nevertheless emphatically of our world, plain and mesmeric at the same time. There is verve and darkness here, a headlong plunge into what language can do where every noun is on the brink of becoming a verb, and the world we think we know is always about to become very much other. Denise Ryan’s is an original, new voice that startles and delights. She brings the reader into the very sinews of her being which encompasses stars, death, love, joy, insects, animals and fields as well as the delight and pain she experiences as a woman. Unexpected metaphors tumble from her poems: a leather dress “shines like a bath full of scorpions” and cobblestone streets “close in like a confession box.” An accomplished debut collection – to read it is to know her and to taste her kaleidoscopic world. 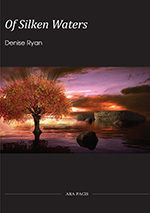 Denise Ryan’s poems are bold and precise brushstrokes that magically weave personal tribulations with the vagaries and timelessness of the landscape that surrounds her. A deft storyteller and sly provocateur, she may at one moment conjure a loving but coarse description of an “Owl Man”, in another touch upon deep chords within her memory to elevate the emotional weight at the center of “Debt Collector.” Ryan’s language is spare but starkly brutal, taking inventory of the wild natural beauty all around her but making sure we know there is a price to pay for engaging with this world. To hail her poetry as being in the vein of a long line of romantic Irish wordsmiths would do her a disservice. She carves out revealing character studies with razor-sharp wit, while hanging onto the fragile edges of her private cliff. This volume needs to be read if only for an appreciation of how skillfully this gifted poet can render people, the past, and her own fitful, soulful pilgrimage through life. A brave and compelling first collection of poetry.